In total, nine Stewart/Stuart monarchs ruled Scotland alone from 1371 until 1603. The last ruler of Scotland alone was James VI, who became the first dual monarch of England and Scotland in 1603. Two Stuart queens ruled the isles following the Glorious Revolution in 1688: Mary II and Anne. Both were the Protestant daughters of James VII and II by his first wife Anne Hyde and the great-grandchildren of James VI and I. Their father had converted to Catholicism and his new wife gave birth to a son in 1688, who was brought up a Roman Catholic and preceded his half-sisters; so James was deposed by Parliament in 1689, in favour of his daughters. 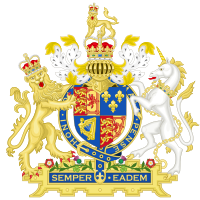 But neither had any children who survived to adulthood, so the crown passed to the House of Hanover on the death of Queen Anne in 1714 under the terms of the Act of Settlement 1701 and the Act of Security 1704. The name "Stewart" derives from the political position of office similar to a governor, known as a steward. It was originally adopted as the family surname by Walter Stewart, 3rd High Steward of Scotland, who was the third member of the family to hold the position. Prior to this, family names were not used, but instead they had patronyms defined through the father; for example the first two High Stewards were known as FitzAlan and FitzWalter respectively. The gallicised spelling was first borne by John Stewart of Darnley after his time in the French wars. During the 16th century, the French spelling Stuart was adopted by Mary, Queen of Scots, when she was living in France. She sanctioned the change to ensure the correct pronunciation of the Scots version of the name Stewart, because retaining the letter "w" would have made it difficult for French speakers, who followed the Germans in usually rendering "w" as /v/. The spelling Stuart was also used by her second husband, Henry Stuart, Lord Darnley; he was the father of James VI and I, so the official spelling Stuart for the British royal family derives from him. The ancestral origins of the Stuart family are obscure—their probable ancestry is traced back to Alan FitzFlaad, a Breton who came over to Great Britain not long after the Norman conquest. Alan had been the hereditary steward of the Bishop of Dol in the Duchy of Brittany; Alan had a good relationship with Henry I of England who awarded him with lands in Shropshire. 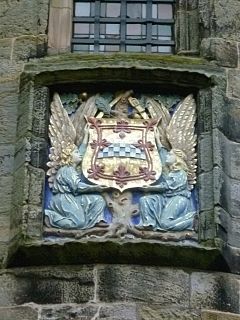 The FitzAlan family quickly established themselves as a prominent Anglo-Norman noble house, with some of its members serving as High Sheriff of Shropshire. It was the great-grandson of Alan named Walter FitzAlan who became the first hereditary High Steward of Scotland, while his brother William's family went on to become Earls of Arundel. Both Mary, Queen of Scots, and Lord Darnley had strong claims on the English throne, through their mutual grandmother, Margaret Tudor. This eventually led to the accession of the couple's only child James as King of Scotland, England, and Ireland in 1603. However, this was a Personal Union, as the three Kingdoms shared a monarch, but had separate governments, churches, and institutions. Indeed, the personal union did not prevent an armed conflict, known as the Bishops' Wars, breaking out between England and Scotland in 1639. This was to become part of the cycle of political and military conflict that marked the reign of Charles I of England, Scotland and Ireland, culminating in a series of conflicts known as the War of the Three Kingdoms. The trial and execution of Charles I by the English Parliament in 1649 began 11 years of republican government known as the English Interregnum. Scotland initially recognised the late King's son, also called Charles, as their monarch, before being subjugated and forced to enter Cromwell's Commonwealth by General Monck's occupying army. During this period, the principal members of the House of Stuart lived in exile in mainland Europe. The younger Charles returned to Britain to assume his three thrones in 1660 as "Charles II of England, Scotland and Ireland", but dated his reign from his father's death eleven years before. The Royal House of Stuart became extinct with the death of Cardinal Henry Benedict Stuart, brother of Charles Edward Stuart, in 1807. Duke Francis of Bavaria is the current senior heir. However, Charles II had a number of illegitimate sons whose surviving descendants in the male line include Charles Gordon-Lennox, 11th Duke of Richmond; Henry FitzRoy, 12th Duke of Grafton; Murray Beauclerk, 14th Duke of St Albans; and Richard Scott, 10th Duke of Buccleuch. In addition, James II's illegitimate son, James FitzJames, 1st Duke of Berwick, founded the House of FitzJames comprising two branches, one in France and one in Spain. The last of the French branch died in 1967; the senior heir of James II's male line descendants is Jacobo Hernando Fitz-James Stuart, 16th Duke of Peñaranda de Duero. Robert II 22 February 1371 19 April 1390 nephew of David II who died without issue. Robert's mother Marjorie Bruce was daughter of Robert I.
Robert III 19 April 1390 4 April 1406 son of Robert II of Scotland. James I 4 April 1406 21 February 1437 son of Robert III of Scotland. James II 21 February 1437 3 August 1460 son of James I of Scotland. James III 3 August 1460 11 June 1488 son of James II of Scotland. James IV 11 June 1488 9 September 1513 son of James III of Scotland. James V 9 September 1513 14 December 1542 son of James IV of Scotland. Mary 14 December 1542 24 July 1567 daughter of James V of Scotland. 27 March 1625 son of Mary, Queen of Scots. 24 March 1603 27 March 1625 Great-Great grandson of Henry VII of England. King of Scotland alone until inheriting the titles King of England and Ireland, including claim to France from the extinct Tudors. Charles II 30 January 1649 (de jure); 2 May 1660 (de facto) 6 February 1685 son of Charles I. Prohibited by Parliament from assuming the throne during a republican period of government known as the Commonwealth of England, but then accepted as king in 1661. James VII and II 6 February 1685 11 December 1688 brother of Charles II, who died without legitimate issue. Son of Charles I. Overthrown at the Revolution of 1688. Died in 1701. Mary II 13 February 1689 28 December 1694 daughter of James II & VII, who was still alive and pretending to the throne. Co-monarch was William III & II who outlived his wife. Anne 8 March 1702 1 August 1714 sister of Mary II. daughter of James II & VII. Name of state changed to Great Britain with the political Acts of Union 1707, though family has used title since James I & VI. Died childless, rights pass to House of Hanover. Jacobitism, for more on the legitimist House of Stuart, following the Glorious Revolution. ^ The progenitor of the Stuarts was Walter fitz Alan, a Breton. ^ The Earls of Galloway are the senior surviving line of the Stuarts. They are descended from a line which originated from the second son of Alexander Stewart, 4th High Steward of Scotland and are not members of the Stewart/Stuart royal line; however, they are part of the peerage. ^ Mackenzie, A. M., MA., D.Litt., The Rise of the Stewarts, London, 1935, pps.8–9. ^ "J.H. Round: The Origin of the Stewarts: Part 1". MedievalGenealogy.org.uk. Retrieved on 13 November 2008. ^ a b c Bartlett, England Under the Norman and Angevin Kings, 1075–1225, 544. ^ Lieber, Encyclopædia Americana, 30. ^ a b c King, The Anarchy of King Stephen's Reign, 249. ^ Alleyne, Richard; de Quetteville, Harry (7 April 2008). "Act repeal could make Franz Herzog von Bayern new King of England and Scotland". Daily Telegraph. Retrieved 22 June 2008. ^ "Studies in peerage and family history". Cassavetti, Eileen. The Lion & the Lilies: The Stuarts and France. Macdonald & Jane's, 1977.